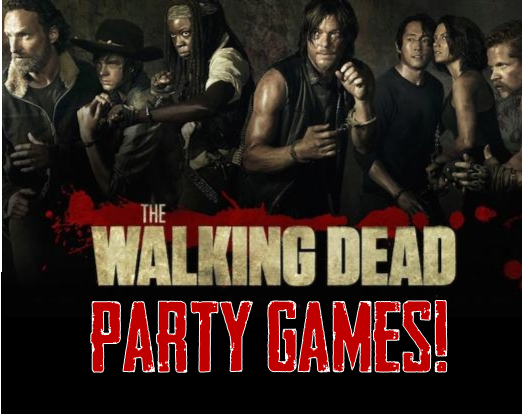 Top 12 Walking Dead Party Games and Ideas! It's that time of year again: the beginning of TV premiere season! Plus, Halloween to boot. The perfect time for a Walking Dead viewing or Halloween party with your favorite zombie show as the theme. But don't restrict yourself -- if this fantastic show is at the top of your list, you can throw one for your birthday, or anytime the urge hits! These tips and games will help you be the talk of the apocalypse party scene. Halloween is the best season to buy decorations and paper products for your Walking Dead party -- paper products, plastic-wear, party favors and decor starring zombies and their hunters are everywhere, from specialty party supply stores, to Amazon, to your local drug and dollar stores. The fall means you can have your awesome soiree without having to listen to your wallet groan or leave its limbs all over the place. 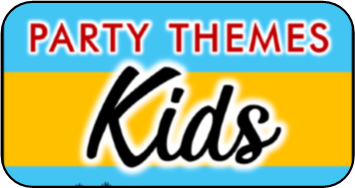 This classic kids' Halloween party game is perfectly serviceable for grossing out adults! Put a series of bowls and boxes on a table, and fill them with nasty-feeling foods: cold, cooked spaghetti worms, peeled-grape eyeballs, mushy-cooked rice mixed with raisins (feels like maggots and bugs), tofu brains! The best one is to have a single box with nothing in it but a hole in the back. When the player reaches their hand in, grab it and watch them jump! Like spin the bottle, but with a bat. You can buy Negan's precious weapon in prop form, or make your own from a wiffle ball bat wrapped with faux chicken wire. You can make it a truth or dare game with a horror bent, or use it as a spinner for games like Walking Dead trivia! (Categories like scariest, goriest, best survivor, etc.) - Guests can cosplay as their favorite WD character or have fun with zombie makeup. Prizes can run from a fun zombie toy to Walking Dead DVD sets and figures! It's easy to locate a jointed paper zombie or skeleton decorations during the Halloween season. They're usually made in such a way that you can remove the arms and legs. Then put a tack through a thigh, foot, hand, femur, etc, blindfold the player, and have them try to tack the zombie/skeleton's limbs back on. Now that you have a bunch of walkers in your house, have them demonstrate their best zombie shuffles and moans, and have the other guests judge! If you're lucky enough to have some land, this is a great game for your Walking Dead party. The rules are standard: whoever is 'It' (in this case, the walker) tries to tag someone else, and if they're caught, they become a zombie, and so on until the world is finally overrun. Or rather, the party is. To make things extra fun, set up a graveyard with cemetery props for people to dodge and hide around. 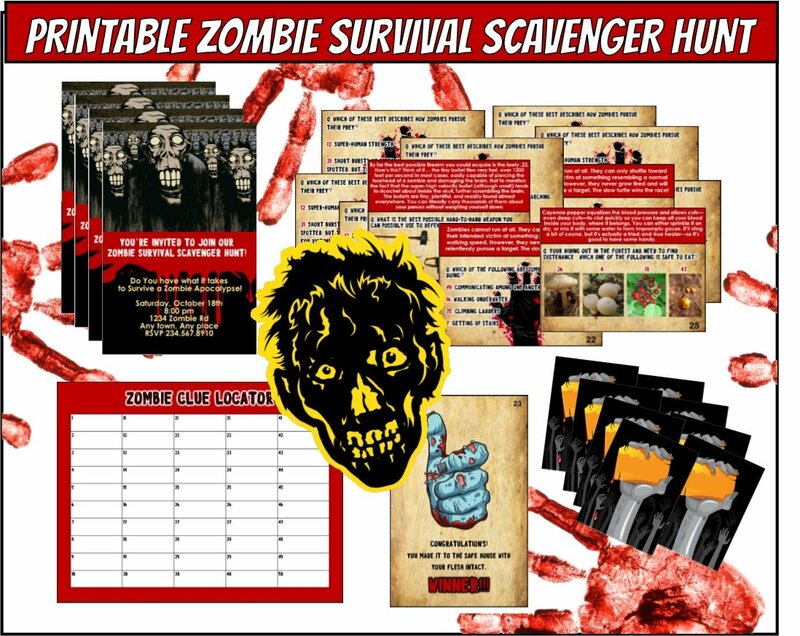 You can download our exclusive Zombie Survivor Scavenger hunt and test your friends Apocalypse survival skills. 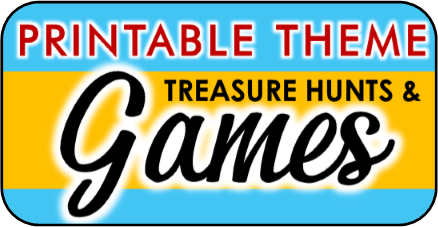 Game has players answer trivia and solve clues - don't get too many wrong or you'll be zombie bait. Everyone who makes it to the end "alive" wins! The best part about this hunt is YOU decide where the hiding locations are so you can play ANYWHERE! It's perfectly gruesome for a Walking Dead party! Purchase or make a piñata in the shape of a human head, fill it with zombie-themed goodies, and let guests take turns with a Lucille prop made from a wiffle ball bat wrapped with fake barbed wire until somebody takes out a survivor! A variation is the Michonne piñata -- same game, but played with a plastic katana sword. Make sure it's a sturdy one, or it will break! Place chairs scattered throughout the party area, and play sound effects like a siren or zombie moaning to alert party-goers to find a seat. Whoever doesn't find one is walker chow! I've also seen this game played with face masks (the paper kind, for when you're ill in a doctor's office), or even costume gas masks. Instead of chairs, everyone must find a mask before the sound stops. Purchase some rubber, bloody ears at your local dollar store, and hide them around the property (in glow-in-the-dark Easter eggs is best for night visibility). People search for them like an Easter egg hunt, and safety pin them on a shoelace they wear around their neck. Whoever has the biggest ear necklace gets the crossbow! Okay, they win, at least. Using standard Pictionary gear (All you really need is a large pad of paper and markers), prepare a stack of Walking Dead-related word cards, and get to drawing! Write down a bunch of your favorite quotes from the series. There are two ways to play this game: either number the quotes and write down the answers on a hidden piece of paper, then have the person who draws the quote guess who said it, or have the answers on the back of the card/paper, and the person who draws it reads it aloud while others guess. To make it extra challenging or for extra points, have players state the speaker, the season, the episode, and the circumstances. Test your WD fan trivia skills!